Do you suffer from baby elephant syndrome? An adult elephant is very large and very strong. It could easily uproot huge trees with its trunk. So how do elephant trainers control adult elephants when they are in captivity. 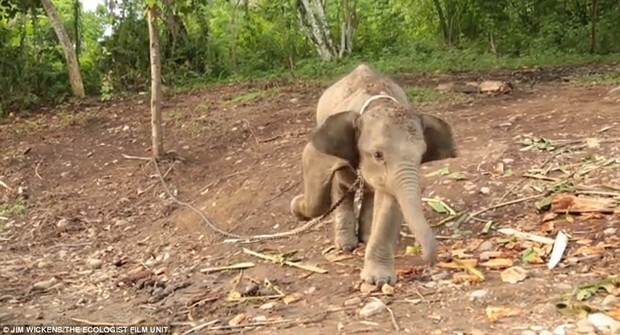 It appears that, when still a baby, an elephant in captivity is tied to a small tree or a stake in the ground with a short rope or a chain every night. Although the baby elephant instinctively wants to roam free, and tries to break the rope or chain, it isn’t yet strong enough to do so. When finally it realizes that its efforts just don’t work, it gives up and stops struggling. Fast forward several years, to a time when that elephant, still in captivity, is a full grown adult. 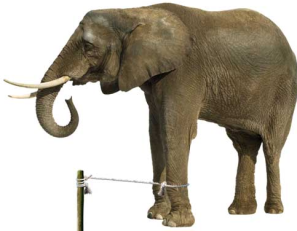 Astonishingly, the large, strong adult elephant can still be controlled with a short rope or chain, never making any attempt to break free, despite the fact that it could now easily do so. It is as if the baby elephant says “There’s no use trying. I give up.” and holds on to that idea for the rest of its life. The elephant’s early experiences continue to place strong limitations on its present behavior. What the elephant learned as a baby continues to impact it throughout its life, despite the fact that the same circumstances no longer apply. 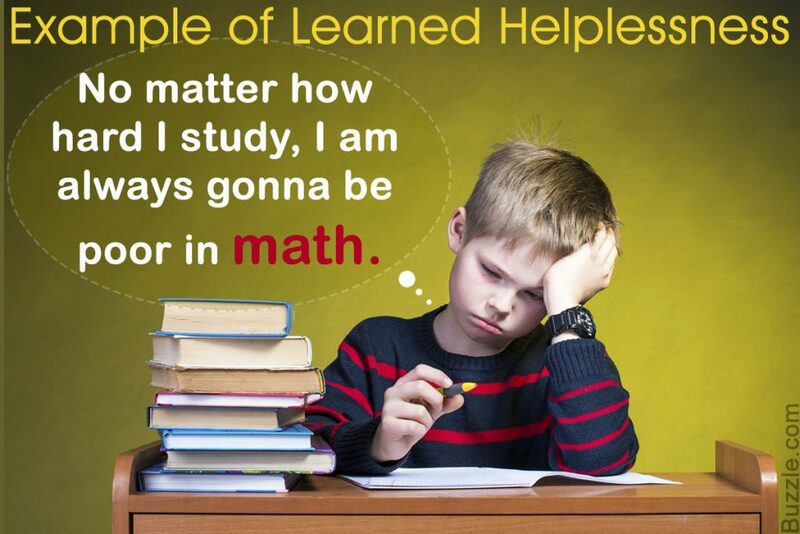 This is very similar to the concept of “learned helplessness” described by psychologist, Martin Seligman. In this case, Seligman and his colleagues found that exposing animals to an uncontrollable painful experience resulted in a later failure to even try to avoid or escape the same painful experience, despite the fact that escape had become possible. 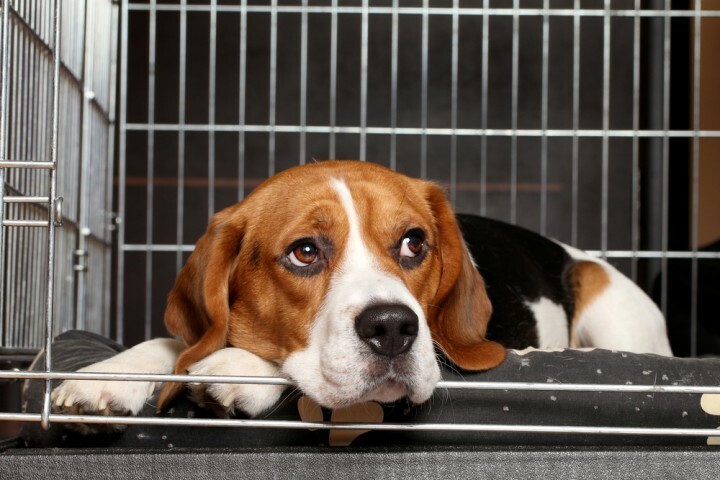 For example, in their earliest studies with dogs, it was found that dogs that had previously received shocks that they could not escape from later became passive, and just lay there being shocked, no longer trying to escape the shock, although it had become possible to do so. The dogs had just given up in the face of the adversity, and never realized that the situation had improved. Similar results have been found with a wide variety of animals (rats, mice, even cockroaches), including humans. In studies using inescapable noise, instead of shock, Seligman found that humans, too, can become passive and just give up when initially faced with uncomfortable circumstances that they couldn’t control. Giving up didn’t allow those research participants the opportunity to realize that things were different, when the situation changed to one where there was control. Do you suffer from baby elephant syndrome? Have you experienced some previous negative experiences that you have carried with you, preventing you from seeing or believing that you are capable of now doing something that you were not able to do in the past? Do you find yourself thinking “It’s useless.”, “There’s no point trying.” Perhaps it is time to think about re-evaluating what you are capable of – to change your thinking. Unlike many animals, humans have the ability to reason and try to understand why they fail or have no control in a situation. Seligman found that not all humans developed learned helplessness, and it depended on their explanations for what they had experienced – what they saw as the causes of their successes or failures, their escape or inability to escape. 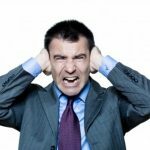 People ask themselves why the uncontrollable bad events have happened and a person’s answer has an impact on whether they will develop subsequent helplessness. situational, not personal – rather than blaming themselves and personal inadequacies, they reasoned that is was something about the situation and outside factors that were the cause of their difficulties. specific, not pervasive – rather than believing that the cause of their failure was a far-ranging problem that would affect a variety of situations, they saw their difficulties as occurring in that particular situation only, and having no impact on other situations they found themselves in. 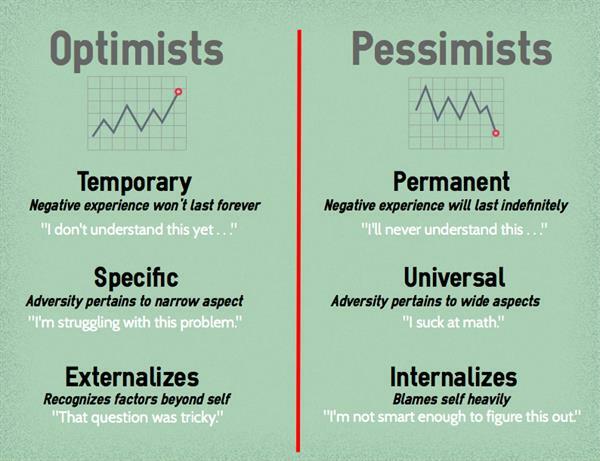 If you come across some problems or failures in your life (and, trust me, you inevitably will – we all do), try to think about them with an optimistic explanatory style – as something that applies only to that specific situation, something that will not last, and something that was due to outside factors, and not because of the way you are! “What happened was an unlucky situation (not personal), and really just a setback (not permanent) for this one, of many, goals (not pervasive)”. 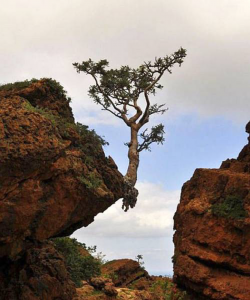 Greet the world with tenacity, and don’t give up! ← Savouring the positive – where are you shining your flashlight?